Do you live in a big house with hard floors? 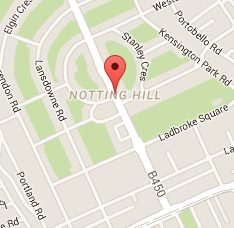 If you do and they are in need of professional cleaning, feel free to call our company now and book our professional hard floor cleaning and polishing service, which is one-of-a-kind here in W11 Notting Hill. 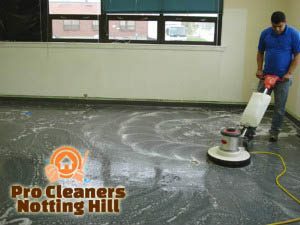 We are offering you to get your floors cleaned by the most expert cleaners in town. Hurry up and call our company now and make an appointment. We will send you a team to the rescue. Our cleaners have experience with a wide variety of hard floors – marble, stone, quarry tiles, limestone, tile and grout, terracotta, terrazzo, etc. We have equipped them with the latest hard floor cleaning equipment and products, and we can guarantee you that your hard floors will be cleaned in depth. What our cleaners will be able to clean thanks to the modern machines they use is – various stains, dust and grim from beneath the surface. We will clean, restore and polish your hard floors, regardless what kind they are. Our cleaners have rich experience with a variety of cleaning problems as well, and know how to take care of them adequately. 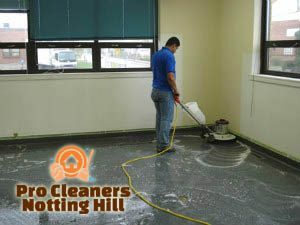 What is more, after cleaning your hard floors thoroughly, our cleaners will use a special buffing machines which will polish your floors, giving them a complete and sparkling look. Be sure to call us as soon as possible, any time you want. Our call centre is available to you 24/7, and our staff is very helpful. Ask us about our prices and packages, and schedule an appointment for your convenient time. We will send you a team of expert cleaners to give you the best hard floor cleaning and polishing service in W11 London. Call us now!